Until recently it was expected that the first pile would be struck into the ground at Nieuwe Maas riverfront in 2020. It already seemed optimistic and now it has been confirmed that Feyenoord City as a project is falling behind schedule. “Under pressure it might have been possible to meet the original schedule, but there were too many risks involved. We didn't want that. That's why we decided to adjust the schedule. The doors of the stadium can be opened in June 2024, so that Feyenoord can play there from the 2024-2025 season.” says Frank Keizer, project director at Stadion Feijenoord N.V. 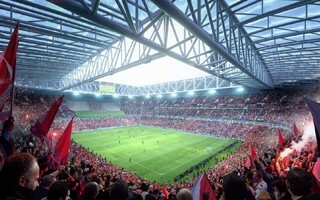 Previous schedule envisioned a mid-2023 opening of the largest stadium across the Netherlands. The new Feyenoord home is expected to hold as many as 63,000 people and will sit partly atop the Nieuwe Maas waters. Even with schedule adjusted by one year, the project is still far from safe. StadiumDB understands there are numerous hurdles still to be cleared, including securing of the funding and land acquisition. Because Feyenoord City involves not just the stadium but also revitalisation of the entire riverfront, numerous plots of private land have to be bought, mostly from industrial owners. And not all of them are willing to relocate their businesses. Also, many conditions have to be met, set by the city of Rotterdam. Only once these are complete, the city would participate as stakeholder with its contribution of €40 million. Meanwhile, the political climate is changing towards scepticism towards the project, when compared with the 2017 reality, when it was allowed to go forward.